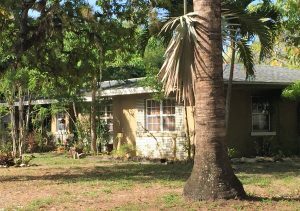 This ranch home was constructed in 1954 for Col. Esher C. Burkart, who retired from the Army in 1954 and came to Fort Myers. A newspaper article in the News-Press discussed his military career, which started with his graduation from West Point and included a post as assistant chief of operations for General Douglas MacArthur during World War II. He was buried in Arlington Cemetery in 1975. In 1925, this parcel was sold for $2,200 by the Dean Development Company to Rescoe Parker, subject to a restriction that a home costing least $8,000 be built on the property. The parcel changed owners several times, but remained vacant until the Burkart home was built in 1954. Dean’s Subdivision, Block H, Lot 1.